Can I get personal for a moment? Ok guys, can I get personal with you for a moment? If you have been paying attention to some of my posts lately, you will know that I have literally been going through a physical transformation. Sometimes you hit a roadblock with life and realize you need to make changes or you will continue down the same path. Well this year I made the decision to change two things about myself that have always been an issue for me since I can remember. My weight and my teeth. With my weight, I have been doing keto and it has been amazing. I have lost a lot a weight but I am not going to share that info here at this moment. I am going to save that for another time. Nope, today's post is about my teeth. I have always hated my smile and have always been embarrassed by my crooked teeth. I never got braces as a teen and when I became an adult other things took precedence over them and besides the cost was outrageous. Well not this year! With the encouragement of my wonderfully, supportive husband, I did it! I signed up for Smile Direct Club back in December and have never been happier! I am in my final 6 weeks and am just blown away by the results so far. The first thing I did was to visit their clinic which was about an hour away for me. I did not feel comfortable doing my own impressions and preferred their option of the 3D scan. Once that was completed, they told me it would take about 3 to 4 weeks to review them and let me know if I qualify. Once I received the email that I was, I was on board. I then had to do a down payment of $250 to get my aligners made. I did that and then it took about another 3 weeks to receive my kit that had everything I needed to start the process. In the beginning I had a couple of Aligners that didn't quite fit and rubbed my gums. I just took their file and all was good. I received everything I needed to do this. I was told it was going to take 10 months to accomplish what needed to be done. The average is 6 months. I am being vulnerable and posting a before/after pic. Now remember, I have also been losing weight so the difference is quite crazy! I just wanted to share because I know at some point we think we are too old to make changes in our life. Well guess what, you are not! So, I encourage you to take a look and see if this is something you would like to do for yourself. If so, click on the link below to learn more about Smile Direct Club. It was very simple for me. I went to their clinic in St. Louis Park where they did a 3D image scan of my mouth. Within a few days they contacted me to let me know I qualified. So I put $250 down for them to create my ligners and within a few weeks I received this package that had everything I needed for the next 10 months. You will not be disappointed and go ahead and email me if you have any questions or visit their website. If you are interested in learning more about Smile Direct Club and if you quality just click the link here. At first I was very hesitant but knew it was something I desperately wanted to do. In the beginning, I had a couple of aligners that didn't fit very well but I just took them out and used the file provided to take away the spot that was rubbing on my gums. It is about 60% cheaper then their competitors and you have the option to pay in fulll or $80 a month. Let me know how it goes for you! Again, here is the link. Here's a little boost for your #motivationmonday! We hope that seeing another collection of our furniture transformations will inspire you to try something new today! These photos are proof that a little creativity and time can make a big change! If you like what you saw today, stop into the shop--we bring hundreds of new things in each week! We are open every week Thursday-Sunday! Or if you have questions about tackling your own DIY furniture projects, feel free to ask us about the paint and supplies we sell in the store! Last month you met Melissa and saw her awesome industrial boy bedroom. This month we are happy to introduce you to Stacey McDevitt, owner of Ramshackled Treasures and show you all the fun projects she has recently tackled in her Zimmerman home. Stacey is a fun-loving and energetic wife and mother of three with a passion for repurposing and design. She grew up on Lake Minnetonka and as an adult dreamed of living on a lake once again. After she and her husband, Dean, had their second daughter, they found a small home for sale on Elk Lake in Zimmerman. They sold their home in Saint Louis Park and moved to Zimmerman in the the fall 1998. "I am a very involved person and the first year I moved here I started a Mom's Club for stay at home moms. Met many women that way and then once we found a church I participated in their weekly bible study." Stacey explained when asked how she went about establishing community after moving and if she had any advice for young mother's who may feel isolated in their communities. "I was very involved with both until [buying] Ramshackled Treasures. Once I had the shop, I reached out to the other women business owners to start Ladies on the Loose. So, I am more of a starter. That might not be a comfort for some. So I recommend women seek to find clubs or groups that fit their interest and if they don't find one then start their own!" Stacey's home used to be a cabin that belonged to the Ridgewood Bay Resort in the '60's and was later sold as a residential property. It has undergone several renovations and add-ons in the decades since. Stacey loves the view from her french doors in her living room which looks out into their private family island that connects to their backyard by a bridge. Recently, she wanted to refresh her living room and decided to paint walls and trim. "I looked up what colors JoAnna Gaines uses in her designs and found one called Colonnade Gray by Sherwin Williams that I loved." She painted the trim and banisters with Country Chic Paint mixing colors 'Vanilla Frosting' and 'Cheese Cake' to achieve a warm white and then adding accents of black on the banister and French doors with the color 'Dark Roast'. This chair was a recent purchase from an occasional shop-- $59! Stacey has always been a bargain hunter, she bought her couch and love seat brand new with the tags still on them at a thrift store for $165! "My style is a mixture of eclectic and French farmhouse—I love anything French! It’s very classic. I’ve been caught in the trends though, in the 90's with the sponge painting, forest green and burgundy and the rose shags." She grimaced, then added as a confession: "I had a peach bathroom." As far as decor goes Stacey loves to decorate her home with unique lamps, pillows and antique lanterns that she buys from the vendors at Ramshackled Treasures and occasional shops across MN. Her lamps were made by a lighting designer who used vintage wine decanters and dishes to create pedestals. “People get so caught up in decorating saying, ‘I don’t know how to do it.' And I always say if you love something, display it in your home and find things that match it or highlight it," Stacey explained. "And you don’t need to spend a fortune. I was a stay-at-home mom who had left the career world to homeschool my kids, but I still wanted a pretty home. So I would start painting things. My family has a joke, ‘Don’t sit too long, mom will paint ya.’"
Want to Try Our Favorite DIY Products--For Free? Ramshackled Treasures is proud to be a retailer for some of the best furniture products on the market today. This month you have the opportunity to try out our favorite paint for FREE! Country Chic is giving away 4oz Paint jars until the end of July. If you haven't tried their amazing products yet, stop into Ramshackled Treasures to claim your free paint. You can easily do a small project, such as a chair or a side-table with this 4 oz jar of our eco-friendly and easy-to-use furniture paint. We want you to experience Country Chic Paint for yourself because we know that you'll fall in love with it! Get your coupon at www.countrychicpaint.com/free-samples then stop in the store to pick out your paint and see what new treasures we have this week! No matter what level of experience you have, there is always something new that can be learned in the repurposing world as new techniques and new products are created. We all have that piece of furniture that we just aren't loving. Perhaps it was something that was repurposed once upon a time and needs a new look, or it is something you just haven't had the inspiration to tackle. Today, we have chosen to share three videos created by our paint distributers at Country Chic Paint. We enjoy using these products on a daily basis and believe they are some of the best paint products on the market today. 1. How to layer different colors of paint. This will create more dimension and color in the piece when you watch learn (in the second video) how to distress your piece. 2. How to wet and dry distress to create an aged, worn look. As straight forward as this may sound, its helpful to learn some tips and tricks about wet and dry distressing so your piece doesn't end up with "chicken pox." Country Chic's Ocean Breeze. Source. 3. How to apply wax and tough coat for sealing and antiquing. Country Chic's Hurricane with White Wax. Source. You can find a range of Country Chic colors and products on the shelves at Ramshackled Treasures. We also have a Painting 101 class coming up on July 14th, August 6th and September 8th or our popular Cabinet Painting class on July 21 and August 18th. A evening of shopping that starts out with pickle poppers is destined to be an excellent time. Last Thursday evening Minnesota "blog moms" had a night out in Zimmerman touring the fun shops, sampling food at the restaurants and meeting the enthusiastic and fun-loving shop owners. The evening began at the The Whistling Pickle, where the bloggers visited over complimentary pickle-themed appetizers and green pistachio cupcakes. Our group then meandered down Fremont Ave, led by our tour guide Stacy McDevitt (owner of Ramshackled Treasures) to ZoChic Boutique. ZoChic is different than other shops in that as well as having a physical store, it is also a traveling boutique that brings the store to your door. Owner, Megan and business partner Becky, are busy ladies between booking 100 shopping parties a year and running a shop, but their enthusiasm for fashion and retail is apparent in their smiles. The Tattooed Lady's shop neighbors ZoChic. At first we were surprised, a tattoo parlor? But the instant we walked in all presuppositions were ended. Sonia, tattooist and artist, had an amazing shop, every wall was covered in interesting art (the majority of which was created by her). 4X4 pencil drawings that looked as realistic as black and white photographs. There were even cabinets with fantastic decoupaged shoes. "We are a little unique," Sonia said with a smile, her hands in the pockets of a gingerbread apron. Sonia explained that her fascination with tattooing began at a young age. Her dad had a tiny, poorly done skull tattoo..."It was tacky and I loved it!" She went to school for fine art and later worked for a year (for free!) for a tattoo artist who taught her about tattooing. It was a treat to meet her and see her art and defiantly worth stopping in. Next stop--The Shoppes on Fremont! Andrea, the pretty owner, greeted us with enthusiastic smiles. She explained that she loves her vendors to embrace their unique styles and so here "anything goes!" There we wandered around the massive shop, discovering a range of prices points, from rusty and junky, to mid century, to elegant or happy chic. By this time we had been plied with wine and chocolate at nearly every stop, but we meander down the street to Ramshackled Treasures and stuffed our faces with cream puffs anyway. Ramshackled's quality never ceases to amaze. You wander in and the first thing you notice is the crystal chandeliers and the light filtering through the large street-facing window. Everything around you is just sweet and lovingly done. Sassy Bean Boutique was up next and offered a wide range of styles from French country upholstery, Minnesota-themed items, to "things found." Owner Tammy, is also a graphic designer and explained that her friend helped her come up with the name, "Because I'm sassy and I'm small like a bean," she explained with a laugh. We then climbed into a "party bus" also known as "the window licker express" and were driven to our next destination by Greg, owner of Ridgewood Bay Resort. Ashley Taylor Salon and Spa was another pleasant surprise and bloggers were introduced to owner, Caryn. The salon has won awards in 2013 and 2014 and prides itself on excellence and artistry with a wide-range of offerings in one location, such as, hair, nail, massage, facials, tanning services and more. Then we climbed back on the "party bus" and onward to Nelson Nursery which has been in Zimmerman since 1979. We stepped into the balmy greenhouse, inhaled the sweet smells and were surrounded by ruffly delicate color at every turn. Interestingly, the Christmas wreaths/swags that the Boy Scouts sell for their seasonal fundraiser are created at Nelsons Nursery and are shipped all across the country. To end the night we landed at ZBG Grill and ate pizza, cheesy bread and house famous strawberry margaritas on their outdoor patio. We were given "Ladies on the Loose" gift bags by the shop owners which contained free paint, Aveda lotions, an audio book, cookie, scarf, mini chalk board and a flower pot butterfly. The bloggers parted ways with smiles, arms full of purchases and surprised by the secrets we'd discovered in the small town of Zimmerman. A special thanks to all the amazing bloggers who attended this event! If you liked some of the things you saw today, the next "Ladies on the Loose" Rustic Whimsical Sidewalk Sale is on July 9th! Bring a friend--there will be special sales, freebees and door prizes! Ramshackled Customer Photos and Contest Winners! All of us at Ramshackled Treasures are so thankful for the continued loyalty we receive from our amazing customers. It's so humbling to know that many of them travel long distances to shop with us on a regular basis. Doing what we love is only possible because you! As part of a June Blog Contest we asked our customers to send in photos of how they have decorated their homes with Ramshackled Treasures merchandise. They did! And now we all get to experience the fun and creative ways they have implemented furniture pieces and decor into their unique and lovely homes. And can we just say, we LOVE how they brought it all together! Amanda J. for the "Junking Queen T-Shirt"
A big THANK YOU to everyone who participated, it is such a treat for us to get a glimpse into your lovely homes! We hope your Memorial Weekend included the lake and loved ones and that you had time to reflect or thank the men and women who have served and sacrificed for our freedoms. Today, we are sharing our top six gift ideas for Father's Day! Unless you're 2016's Super Daughter/Son you probably haven't decided what you're getting dad--lets be real here--you probably haven't even thought about what you're getting him. Of course there's the default gifts which we all know on sight: belt, socks, cufflinks, gift card...FACE PALM! Believe me, no judgement, we've all been there, we've all done it and will probably do it again. But why not give him something different this year? Maybe offer to decorate or organize his man cave or spiff up his garage for him? Yes, this is holy ground we are treading on, and chances are he will say no, but it doesn't hurt to ask. Regardless, of what he says, you can still buy him a little something to make his happy place more personal and manly! The following is a list of our TOP SIX Father's Day man cave ideas, created by our Ramshackled artist and currently at the shop. We take custom orders so be sure to contact us if you having something special in mind that you didn't see here! If you like our blog "Subscribe" below to receive notifications of weekly posts and news on special events, discounts and giveaways! Often we meet customers who are intrigued with the idea of painting their own furniture, but haven't yet taken the plunge. First, if that's you, let us assure you that it's not as hard as it looks!! And once you've seen the results of your handiwork--you'll be hooked! Gorgeous dresser painted with Country Chic Paint by our lovely vendor Tammi! Painting is kind of an addiction for us--it's in our blood! Today, we wanted to take a few minutes to answer questions that beginner painters may have and explain the process of prepping and painting your first piece of furniture. We hope it gives you the courage to roll up your sleeves and paint something amazing! How do I prep a piece of furniture for paint? 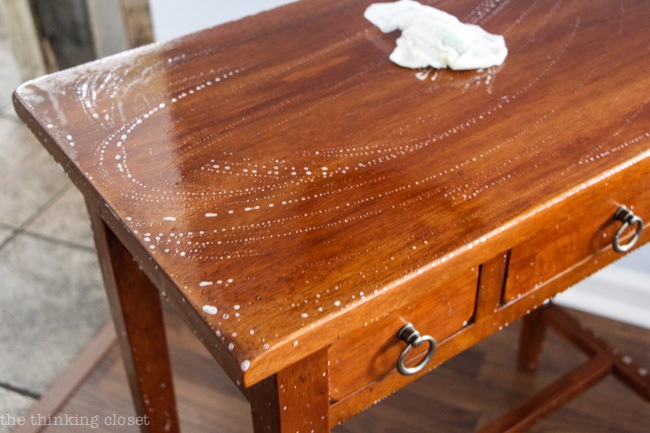 If you are using Country Chic Paint (our personal fav) little to no prep is needed, however, it is advisable that you clean your piece of furniture thoroughly with a rag and soapy water because residue or dirt may compromise the perfect adhesion of the paint after it dries. The piece I have was already painted once. Is that okay? The short answer...yes! However, if the previous paint is chipping off in nasty flakes, you will need to sand it. Does it matter if the previous finish oil or water based? If the piece was previously painted it is helpful to know if the old finish is water based or oil based paint. You test this by taking a q-tip dipped in acetone nail polish remover rubbing it on the piece. If you see color coming off and staining your q-tip then you know it is water based and you can go ahead and paint over it. Oil based paint will not show any color on the q-tip. If a previous oil base paint finish exists, it is recommended to lightly sand the surface with a fine grit sandpaper. Okay, my piece is clean, now what? Give the paint can a good shake, remove lid and then stir for 2 minutes. How do I hold my brush? For best control of your brush hold it on the ferrule (the metal part of the brush). With your thumb on one side and the other fingers holding the other side. Dip about half the bristles into the paint. Don't over dip the brush otherwise you may experience drips. Does it matter what direction I apply the paint? When painting your piece, always paint in one direction otherwise you may experience too much texture in your finish. You want your piece to be smooth--like frosting on a cake! Don't paint over sections that have partially dried already. You can always go back and fix it once it is fully dried. Avoid painting in direct sunlight or when the humidity is more than 80%. Paint your furniture in your favorite Country Chic color and you'll be hooked! If you have questions regarding a current project feel free to ask any of us at the shop, or leave a comment, we'd love to help! Recent Country Chic Beauties by our Lovely Vendors! If you're interested in painting like a professional and would like to be apart of a fun group environment we offer classes!